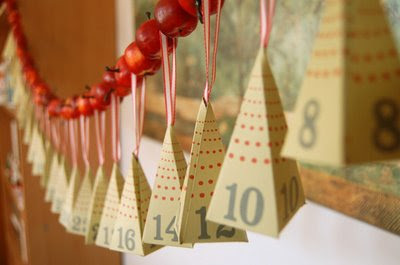 Saw this pretty little Garland of Boxes Advent Calendar last year on a lovely blog. It was so memorable that I had to go back and find it for you. Then I saw it on another favorite blog the other day. Leslie, you've got great taste! There's even a link to the template for making the boxes. I'm not sure how well this idea would last from year to year but it sure is cute!